Flexible workplace policy and procedure focus on creating a modern employer and employee relationship by giving utmost importance to productivity. This type of arrangement mainly talks about the changes that may occur when it comes to schedule examples, the location of the workplace, and the metrics that will be honored and implemented to achieve optimum results even without the presence of traditional working conditions. 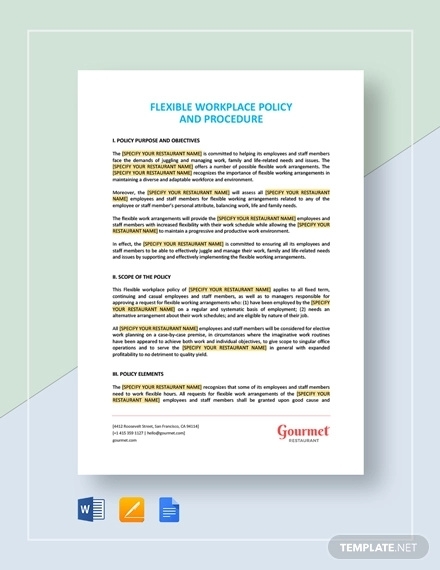 The policy related to flexible workplace and procedures are commonly documented to ensure that the range of the policy execution is clarified and precisely stated. This can lessen or even remove the possibilities of misunderstanding between the employer and the employee due to misleading details or vague information. Hence, it is essential to have a business meeting agenda when you are planning to talk about this matter. 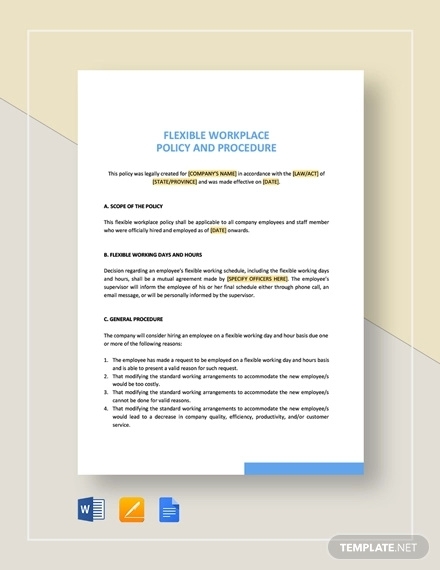 What is a Flexible Workplace Policy and Procedure? The implementation of sharing one work designation to two employees, or in some instances even more. The discussion of the regulations for home-based work which range from an employee reporting in the work location for a number of times on a certain time duration up to actually working from home for the entire operational year. You may also like financial policy examples. The conversion of employment condition from full time to part time depending on the instances and responsibilities involved in the work position of the employee. The specification of the fields works of the employee which are converted into office hours for payroll purposes. There are still a lot of agreements that can be included in a flexible workplace policy. Again, these items vary on the company where you are currently working. Usually, meeting schedules are done to address issues of flexible workplace arrangements. Ensure that you will be aware of this information as it is essential for both the employer and employee to have knowledge on the terms, conditions, and limitations of the flexibility of the work arrangements within the business. Flexible workplace policy and procedures can only be effective if elements concerning productivity and overall operational impact can be assessed. Listed below are the factors that should be considered before the actual implementation of flexible workplace policies and the procedures that are needed to be followed both by the business and the employees regarding the matter. You may also see training policy templates. The scope of the policy implementation. The alignment of the flexible workplace policy with the operational demands of the business. The records of the employee’s productivity which should be maintained or even developed once the policy has already been implemented. 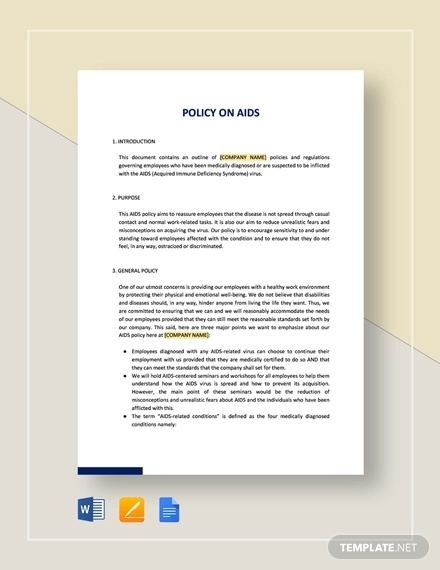 You may also see insurance policy examples. The ability of the employee to retain the privacy and confidentiality of the work even when doing the activities outside the work environment. The characteristics of the employee especially in relation to the work ethics and the ability to provide his or her promised deliverable. It allows employees to not only excel and be productive in the workplace but also in their personal lives, especially those that involve their family and relatives. It promotes employment flexibility which is a great way for people to find balance when it comes to decision making and taking both corporate and personal responsibilities. It can harness a more professional relationship between the employer and the employee as trust and credibility can further be implemented as long as the flexible workplace policy is followed and proper procedures are done. It can provide the needs and demands of the business while giving the employee the chance to work on his or her phase. This helps in employee retention which in turn can also positively affect the business. You may also see company policy. In most cases, it is the managers who give the signal on whether a certain policy can benefit both the business and the employees. There are several entities from the upper management who review the recommendation so you can ensure that the flexible workplace policy has been assessed accordingly even before you receive it. Hence, you need to be professional when inquiring or asking questions about the content of the document. You may also see theft policy. Depending on the regulations of your company, a request may be necessary before you are allowed to have flexible work arrangements. This depends on the capacity of the business to operate with the flexible policies requested, the cost that the employer needs to consider, the practicality and efficiency of the flexible work arrangement and the overall impact of the policy clauses to the stakeholders of the simple business. Having a flexible workplace policy should be implemented accordingly so that the employees are well-guided on how they should perform. The procedures involved in the execution of this policy shall be honored as the employer and the employee needs to ensure that they can fulfill their responsibilities with one another. You may also see travel policy examples. If you are tasked to create this particular kind of policy, ensure that you are guided by the regulations of the business. We suggest you refer to samples of existing flexible workplace policies used by other small businesses in the same industry where your company belongs. This will help you to develop an effective document based on industry standards. Once you are already in the process of making this document, review the items that we have discussed in this post so you can refresh your mind on how you can come up with a highly-usable flexible workplace policy.